Heading out of Turtle Bay now. Winds look light for the 240 run to Bahia Santa Maria. Crew of s/v Ventured, s/v Deep Playa and s/v LightSpeed share a beer in Turtle Bay, Baja Mexico. Turtle Bay baseball game with the locals. Kathy hit tons and Dave hit home run. Fun. 'Shell' are new kitten taking her turn on watch at the helm of s/v LightSpeed on the Baja Ha Ha 2011 as we embark on the first leg of our around the world sailing adventure. Close quarters at the Baja Ha Ha 2011 pre-start near Shelter Island in San Diego Harbor. Baja Ha Ha 2011 fleet heading out of San Diego Harbor. Dave doing his best to fly the spinnaker aboard S/v LightSpeed at the pre-start of the Baja Ha Ha 2011 rally to Cabo San Lucas. We won a free pizza from the race committee for our efforts. Kathy ready to launch the spinnaker in her undies. Cool bird of prey that hitched a ride on sailing catamaran LightSpeed sailing to Mexico in the Baja Ha Ha 2011. These tasty live lobsters went right to the galley for lunch. Kitten 'Shell' checks out some fresh Lobsters. We traded these three lobsters for 8 PBR's. Baja Ha Ha Leg 1, Day 2 Morning update. Yesterday, we flew our spinnaker into the evening as the winds went light. A little after sunset we decided to drop the big sail when our boat speed dropped into the 3 knot range with 6-7 knots true wind. At that point we fired up our port engine and motored with the remainder of the fleet overnight. The biggest hassle with the Ha Ha is the density of boats for the first 12-18 hours. A moonless night demanded super vigilant attention to the surrounding boats via AIS, Radar and visual. At one point we could see 17 boats in a 180 arc ahead and 40 boats in a 180 arc astern. Up to 15 of these boats were in a 2 mile radius or less. I will add that every boat ahead of us was motoring and had likely never set a head sail all day. Not sure why you'd enter a sailing rally then not even try to sail? Seems like a few of these guys are racing to Turtle Bay burning tons of fuels so they can be first in line at the fuel dock to be sure they get their fill. The problem with this wasteful behavior is that there is a limited supply of fuel at Turtle Bay so the faster they go the more they waste the more they screw the boats in the back of the fleet. This worked great for me and I slept well. Kathy got some solid sleep as well which doesn't always come easy the first night out. So Kathy had a great breakfast ready for me at 07:30 and we popped the spinnaker up in the building morning winds. Mostly 10-13 knots true from 330T which is driving us along nicely at 6 to 8.5 knots on a surf. Pulling past all the bigger 45'+ mono-hulls that motored past us overnight. Our AIS shows most of the nearby boats running around 4-5 knots. So for those who wonder about catamarans, light wind performance is one of the big benefits. Our 6-8 vs there 4-5. 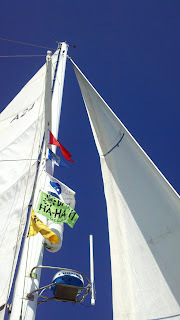 Plus, flying a spinnaker on a catamaran is so easy and we can run deeper downwind due to creating our own apparent wind. So we get speed and course over the much longer mono-hulls. Beautiful sunny skies today with outdoor temps at 65F making for another barefoot, board short, short sleeve day aboard LightSpeed. Trailing a fishing line, but water temps are hovering around 60F and we need a few more degrees warmer before we hit the Yellow fin tuna which are reported to be about 160nm due South of San Diego. Our new kitten 'Shell' is doing great having gained her sea legs. Lots of energy and tons of laughs as she tears around the cabin attacking both real and imagined objects. Monday morning we start the Baja Ha Ha sailing rally to Cabo San Lucas. So, sometime on Monday October 24, 2o11 our USA cell phones will be out of service, but as always you can email us at the addresses on the left side bar. We usually check our email daily. So the Baja Ha Ha rally should be a kick. Over 160 sailboats will be participating, so lots of socializing at three big parties along the way, Turtle Bay, Bahia Santa Maria and Cabo. The first leg of the rally is around 333 nautical miles so depending on the wind we'll be out on the ocean for about 48 hours. Then a three day stop at Turtle Bay and then repeat for Bahia Santa Maria. The last leg to Cabo San Lucas is much shorter. Already met lots of new friends and caught up with quite a few friends from the 2005 Ha Ha . Hope to start posting to the blog more frequently now that we have some new adventures ahead of us. Heading out of Humboldt Bay for a second try at rounding Cape Mendecino. Yesterday we got within a few miles of the Cape and decided to turn around. Two other sailing vessels slightly closer to the Cape were experiencing 30+ knots of wind and steep choppy seas out of the South. The NOAA forecast had called for 5-10 knots which even considering the 'Cape Effect' was way off. It's always tough to turn around and give up hard earned miles, but getting hammered by 30 knot winds on the nose is never fun. Back in Eureka the crews of Indigo, Ventured and LightSpeed made a personal visit to the NOAA forecasting office to gain some insight on unexpected 30 not winds. A always helpful staff at the Eureka NOAA office was very accommodating and one of the forecasters explained the unusual 'Strata Surge' that had forced us back into port. The weather outlook for the coming week was less than ideal and it looked like our next good weather window might be seven days out. So anxious to get South we headed out of Humboldt crossing the bar around 2PM. Winds were initially out of the NNW at 10-15 then switched to SSW as we approached Mendicino and steadily built. About 4 miles from the buoy winds were in the high teens out of the SSW and as we rounded the Cape peaked at at steady 25, not counting gusts. The seas generated were steep and of a very short period which really slows down the boat as it crashes into the waves, rides over the crest and crashes into the next trough. Lots of water tends to fly on the bigger sets and we just sort of hold on secure and snug inside out pilot house. We've grown pretty soft sailing the pilot house catamaran where our offshore sailing attire is short sleeve shirts, shorts and slippers. When we need to go outside to quickly handle a sail we grab a light weight shell and slip into some Crocs or deck shoes. Nothing like the days of having to gear up for a watch and sit out in the cold and sometimes wet cockpit. Despite being stuck in port when we'd have rather been sailing, we did get plenty accomplished. Mostly ordering bits and pieces for our many boat projects, spare parts and provisioning for the South Pacific. It's also a great chance to meet fellow cruisers and we enjoyed the company of Mac and Catherine of s/v Indigo a beautiful 42' Nauticat. Mac and Catherine hailing from Portland Oregon are headed to Mexico as well so we hope to share an anchorage or two down the line. We also met Irlin and Jenn from s/v Ventured sailing a Tartan 37' hailing from Seattle, Washington whom are joining in on the fun of the Baja Ha Ha. With the Baja Ha Ha starting on October 24 this year, those of us still 500 nautical miles to the North of the start line are beginning to feel the pressure. Our newest venture aboard LightSpeed is growing our own food. Our friends Jasmine and Shannon of Astoria, Oregon loaned us a book called 'Sailing the Farm' which has a strong focus on self sufficient living aboard a sailboat. The sections that most interested us were sprouting various seeds and grains and the growing of wheat grass from which we can extract the healthful benefits of wheat grass juice. So we ordered sprouting trays and are testing out a wide variety of sprouts to see what we like best. The book also has a nice section on edible seaweed, but we haven't experimented with any of the many clumps of seaweed we frequently sail by. My other major project is replacing the standing rigging on LightSpeed with new terminal fittings, wire and turnbuckles. Quite the effort to design the system and source the parts. I sent out a RFP to a bunch of rigging and rigging supply shops and the next step is evaluating the proposals and selecting a supplier so I can place an order.